After months of rumors, this morning it became official: Charter plans to step in where Comcast failed, with a $55 billion plan to acquire Time Warner Cable. Regulators looked unfavorably on Comcast’s bid, finding it would have too many negative effects on consumers and on competition. But Charter clearly would not be trying its own takeover, with such a huge price tag, if they didn’t think they stood a good chance of success. So what makes the second offer so different from the first — and is it any more likely to succeed? Charter CEO Tom Rutledge said in a call this morning, “We’re a very different company than Comcast, and this is a very different transaction,” which is true. But a few big differences, in this case, might just add up to “acceptable” in the eyes of the FCC and Department of Justice. But of course, that didn’t happen. This merger, however, might. Charter’s arithmetic, which includes business customers, says that the transaction will give the new Charter a combined 23.9 million customers in 41 states. Charter’s reasons for wanting to spend a ludicrous amount of money on this deal, then, are pretty clear cut. The new company would vault from the middle of the pack to the head, suddenly becoming a force to contend with. The only company larger would be the still-pending merged AT&T/DirecTV — and they would exceed Charter in video customers, but not broadband ones. New-Charter’s footprint, from Charter’s investor presentation on the merger. Where size was an obstacle for Comcast when it came to wooing regulators, for Charter it may prove to be an asset. Comcast was (and is) already the largest cable company in the nation. Buying the second-largest would have vaulted it so far ahead that the also-rans couldn’t be considered actual competition, and would have given it undue influence up and down the business chain, as well as over customers. But the second, fourth, and sixth largest companies, joining together to form a company about the same size as the current number one? Well, that’s a different matter. The FCC and DoJ might determine that although end consumers would be losing options, as far as the national-scale marketplace goes, creating a counterweight to Comcast may in some ways actually increase competitive pressures. Starting a new competitor from scratch is not going to happen — but building one from a handful of smaller companies might succeed. It’s not just in the arithmetic where Charter benefits heavily from not being Comcast. Comcast is way more than “just” a cable company. In addition to pay-TV and voice services, they are, most importantly, also a broadband provider and a content company. Comcast’s unusual reach has created a situation where, as it expands, it grows ever-increasingly in competition with itself as well as with everyone else around it. Those were the core antitrust arguments against letting Comcast get bigger by buying TWC. Comcast, as a platform with their own video streaming service, as well as broadband service, as well as pay-TV, is in a position heavily to control what can move across its networks, to whom, and how. While the new open internet rule will prevent much nefarious behavior, the fact of the matter is that Comcast does not exactly have a great track record. Their public reputation in basically every sphere is very negative… and they’ve earned it. Their customer service is legendarily bad, with Time Warner Cable at the bottom of the heap with them. Many of Comcast’s worst service nightmares in recent years have been recorded and traveled far and wide over the internet at the speed of, well, your local broadband provider, and it’s been ugly all around. Additionally, lawmakers and regulators casting an eye over Comcast’s TWC purchase plan had a history to look at: Comcast’s behavior after acquiring NBCUniversal in 2011. And that record likewise was not good. Comcast had to agree to many merger conditions to make the NBCU purchase palatable to regulators in 2011, and by 2014 had already missed some deadlines and incurred some fines for not doing so. And then the interconnection disputes between Comcast and Netflix hit, and were resolved only when Netflix cut Comcast a big fat check for better access to Comcast subscribers who were already paying Comcast for their internet access. All of that forms a very bad tapestry against which to try to convince regulators that your plan to become enormous is sound and harmless. And all of it makes a big pile of poo in comparison to which Charter can come off as clean and shiny. When it comes to customer service, Charter’s reputation is mixed. But in comparison to Comcast, it’s well ahead by virtue of not having had any internationally viral terrible service recordings in the past year. And as for a business reputation? Charter actually went bankrupt in 2009 but emerged successfully from restructuring, going back on the NASDAQ in 2010. Whether or not it’s a good idea for them to take on debt again to buy TWC is a matter for investors to decide. But they’re probably not going to have media companies lined up around the block to say why they’re so terrible to work with, either. It might! And it also might not. Right now, it’s just too soon to tell. There’s no knowing what the proposed transaction will look like until it’s actually filed. The process is about the same as the now-defunct Comcast approval process, but the players are new. FCC chairman Tom Wheeler went out of his way last week to contact the CEOs of Charter and Time Warner Cable to let them know that the FCC is not necessarily hostile to all cable mergers. The commission, Wheeler reiterated, will judge each case on its own merits, as it should. 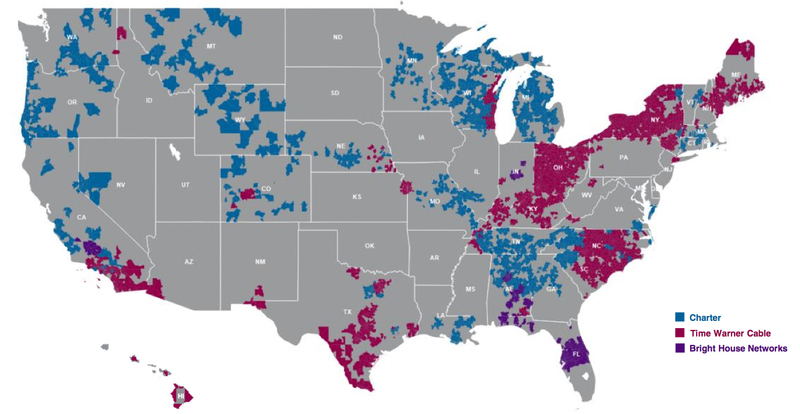 The broadband competition situation is no better now than it was last year, except in a handful of cities. Mobile data is still not really competition, and “broadband” is still mostly not. Regulators will have to weigh those issues against all of the comments, petitions, and data that are about to start flowing in from businesses, advocates, and consumers. Wheeler said about the merger that “an absence of harm is not sufficient,” and that the companies will have to prove that their merger is actively in the public interest to succeed. We know only one thing for sure right now: in the world of cable, it’s about to be another long year.